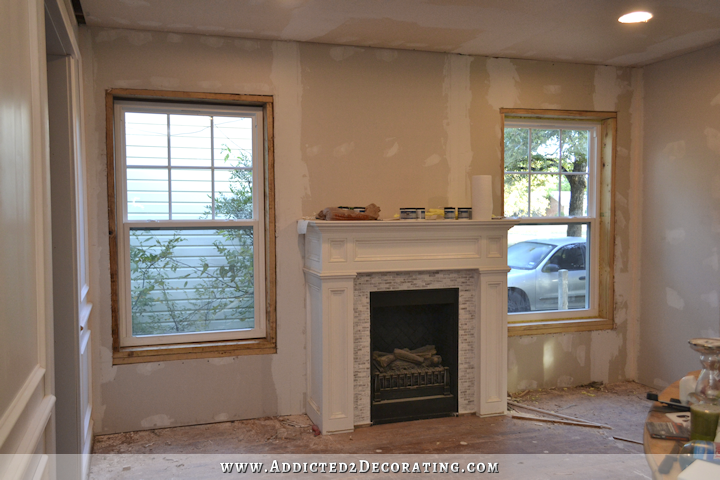 I shared this on my Facebook page yesterday, but for those of you who missed it, my fifth and final dining room window (the one to the left of the fireplace) was installed yesterday morning! The other four were installed last Thursday, and since they finished up the fourth one at about 4:30pm on Thursday, they decided to wait until Friday to install the last window. We were expecting rain (tons and tons of rain), so Friday morning it was a race against the storm clouds. The guys arrived at 8:30am, and just as they arrived, it started sprinkling. They sat in their truck to see if it was going to let up or get heavier, and about 20 minutes later, the bottom fell out of the sky. And it rained almost non-stop for the next two-and-a-half days. I was so disappointed, but there was nothing that could be done other than wait. But they’re finally done. ALL of them. The room looks so much brighter now, and the new windows are so clear! All weekend, I’ve been experiencing a feeling similar to the one you get when you go way too long without having your eyeglasses/contacts prescription updated. Your old prescription just doesn’t quite cut it anymore, and trees just start to look like blobs of green. Then you go and have your prescription updated, and get new eyeglasses or contacts. You walk out of the doctor’s office wearing your new prescription, and you’re amazed at what you see! You’re reminded that trees actually have individual leaves! Grass is actually made up of individual blades! And you can, once again, see all of it! I’m telling you, these new windows feel very similar. Those old windows were so cloudy and filthy, impossible to open because most were painted shut, and they all had those awful blue tinted storm windows that had to be unscrewed and completely removed in order to clean the outside of the windows (which obviously I never did, because it would have been a whole lot of work for very little payoff). Nothing viewed from those windows looked clear, and the view from the one window was blocked even more with the A/C unit. But not any more!! Anyway, I had hoped to get the first four windows trimmed out over the weekend, but to be quite honest, I didn’t feel like getting out in the bad weather. Now that the storm clouds have passed and should be gone for at least two more days, I hope to head to Home Depot today and get everything I need to get those finished up by the end of this week. In other news, I’m still only about halfway done with the music room ceiling. I’ll share the rest of those details as soon as I have something to share. 🙂 But now that I’m nearing completion on the ceiling, that means I’m almost ready to start on my walls!! I’m so excited about starting on that project. I’ve been talking about it and planning it for so long now, so I’m ready to stop talking and start doing. I love the general design of that wallpaper, but I did want some changes made before I put the design on my walls. First, I don’t really like how so many of the leaves look scribbled rather than drawn. Also, a lot of the leaves look very thorny, and there’s something about that that seems cold and unwelcoming to me. (Is that just me being weird, or do you see that too?) I wanted the leaves to look less scribbled, less thorny, and I also wanted berries added to the design like my mom did on my niece’s wall. And finally, I wanted all of the butterflies removed. So here’s her revised version of the Schumacher design. I love that so much more! But with the butterflies removed, that only left me with five birds in the design, and the original design had a total of 13 birds and butterflies, which gave it much more color. So I set about adding more birds. I just copied and pasted from several other wallpaper designs, and the actual colors that I end up using may be different from the cut-and-paste version here, but this is pretty much the design that I’ll end up with on my walls. I also copied and pasted more repeats of the pattern so I can get a better idea of how the pattern repeats go together. I know this will sound strange, but I really like repeats in wallpaper. 😀 I think it just fits my personality that craves order and symmetry in design. Maybe. But I definitely prefer wallpaper over murals. How about if you just switched up the placement of some of the birds from section to section? Then you could just do the repeat with the branches/leaves. I could certainly do that! 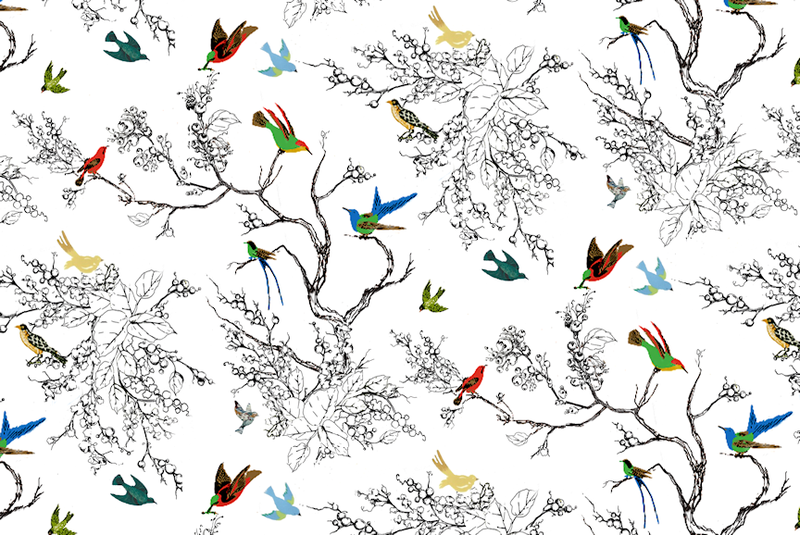 The repeat of the branches and leaves would give me the balance that I need, but the random placement of birds would give it more of a custom mural look. And I do plan to do all of the branches/leaves first, and do the birds last, so I could play around with different placements. Forgive me if anyone has asked you this already, but is there a way of stenciling the basic design on the wall? It would seem to me to be a less perilous way of working. Also, are you going to be sketching the design in pencil first, and then using the sharpie over it? PS – your windows look amazing! How much would it cost to put the actual wallpaper down? I haven’t figured the cost, but the original Schumacher wallpaper costs about $330 for a double roll. This design doesn’t really translate into a stencil. With a stencil, you have to end up with one solid piece of plastic with the design cut out, which means that all of the cut out pieces have to be surrounded with plastic that remains, which is why stencil designs are always much simpler with less intricacy in the design. It would be virtually impossible to translate this design into a stencil. I’m hoping to just use a marker and bypass the need for a pencil. Pencil marks bleed through paint, so if I get did the pencil first, and then went over it with the marker, if I got off the lines at all, the pencil marks would show and couldn’t be covered with paint. You could always have custom wallpaper printed. I was searching for something online a while back and stumbled upon all kinds of companies that offer custom wallpaper, fabrics and murals printed from your design that you upload. For what it’s worth – speaking as someone who has done murals on large walls – it’s actually easier to do repeats. When you are working on a huge canvas like a wall repeats help you to balance the overall design so the distribution of imagery is more even – and you don’t load up one section with branches and another with birds or have gaps that need to be filled in later with imagery that’s not to scale with the rest of it. 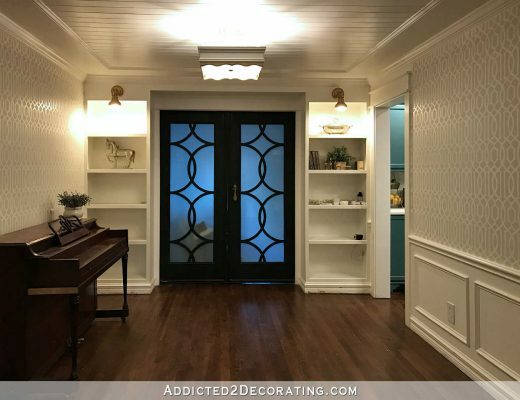 It’s a better bet to design with a repeat right off the bat so you can lay out your pattern over the walls – and then do some fudging if you like/need to around doorways. I think you’ve pinpointed my issue with so many murals/freehand designs, and why I prefer a pattern with definite repeats — the even distribution of the design. I’ve seen way too many hand-drawn design that end up looking so unbalanced and not very well-planned. Of course, I’ve seen some amazing (and amazingly executed) mural designs as well, but that takes a very artistic eye a loads of practice to master. I have virtually no experience with wall murals, so a pattern repeat is a safer bet for me. Don’t forget, you could add dots of color to your berries. We have lots of trees/bushes/scrubs, in Texas that put out colorful berries in the late summer/fall. They range from bright red to orange/gold to even green. Lots of artist options! Can’t wait to see how you decide to finish it! No pressure!!! LOL! The whole time you’ve been talking about this hand-drawn mural, THIS has been my fear…the lack of balance. I do agree with the above commenter that maybe you could vary the birds, while keeping the branches/leaves/berries in a pattern. And if it’s a matter of not having enough, birds or needing an additional one somewhere to create balance once you have furniture/fabrics, etc. in place it would be a relatively easy update to make. Also, random question, that maybe you’ve answered before and I’ve missed or forgotten…what will be on the wall opposite this mural? I’m using this design as “wallpaper” in the whole music room, rather than just using it on one wall as a mural. That will basically amount to two large sections of wall since this room has relatively very little wall space. One “wall” has no wall space (the pony wall and columns “wall”), and the opposite wall has virtually no wall space that shows when the doors are open. Love the idea of repeating the pattern…that’s genius! I think I would make a stencil for each of the bird’s major shapes and layers (two or three), then go back and fill in the detail/highlights/floats by hand. Big job, Kristi, but you rise to every challenge! I love your new windows! It gives the room an open look. Your analogy was perfect and right on target. 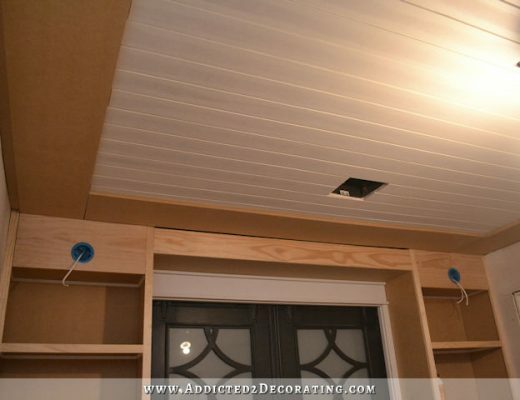 Can’t wait to see the ceiling and painted wallpaper in your music room. While my tiny mind can’t picture the whole room like that, I am sure that it will be amazing. Hooray for those long awaited new windows! It really makes the whole room look more open and inviting! I love your Mom’s revised version and I love the additional birds as well. I think your wall’paper’ is going to be truly stunning!!! wallpaper. I liked your overall vision for the room but the paper seemed a bit too bushy/busy for me. I really like the way you’ve thinned out the leaves. Can’t wait to see the final room. I know it will be fab! I love all of your choices in wallpaper and paint colors. And your windows are wonderful. Keep on keeping us informed. Kristi your windows are lovely. Congratulations of getting them installed and being to paitent about the process it would take to get them done! Bravo! Wall paper repeats are right on; the wisdom and balance are so important. And the birds well you can add them one at a time and balance as you go. Looking really wonderful! Wow the windows make such a difference! This may be a silly question but could you take the redesigned version by your Mom and send it to one of those online printing shops and let them make wall paper for you? Aren’t there sites that do that? Would that be cheaper than buying the original? Maybe that would be a copy right issue. Not trying to suggest you not draw it, because I’m sure it will turn out great, but is making your own wall paper from her mock up an option? I soooooooooooo want this as wallpaper for myself but don’t have the talent that Kristi and her mom have for doing it freehand. I would definitely buy this as wallpaper on a site like Spoonflower.com if you would consider putting it there (for your non-artsy subscribers)! Is that a possibility?!? I really do think it might be a copyright issue. I’m not sure, but I don’t know if I want to take the chance. There are places that will do that, like Spoonflower. It would be MUCH cheaper than the original wallpaper (which costs about $330 per double roll), but I do think it might be a copyright issue. 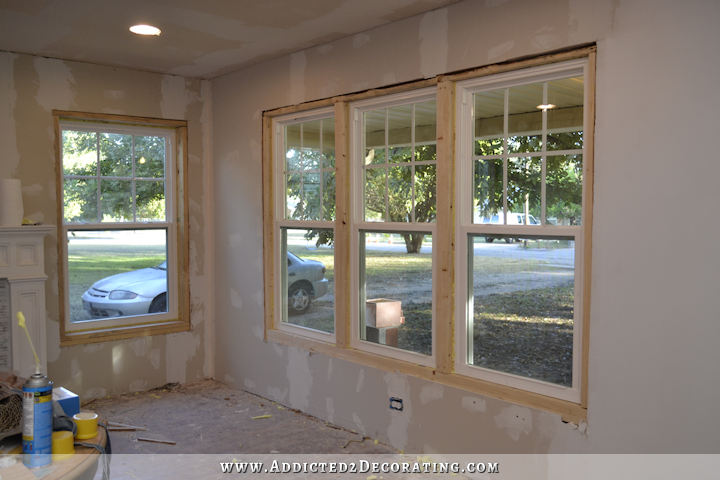 I absolutely love how your new windows really brighten up the room, I can hardly wait to see how they look trimmed out and the walls finished. Perfect analogy on looking through old glass, no amount of cleaning will make a bit of difference 🙂 I’m not sure if you have ever tried the polishing cloths and microfiber cleaning cloths from Norwex but they will keep your new windows spotless without using any chemicals, crazy as it sounds you only use water and they stay cleaner longer. You are amazingly talented and I look forward to your blog every day! I love the new wallpaper design with the berries and changes to the leaves however even adding more birds it seems to be missing something to me. Maybe its because before my eye saw the contrast of butterflies and birds and now the only color I see is just the birds. How about if you added just a bit more color by maybe randomly coloring a few of the leaves and or berries just to give color to something else besides just the birds? With just the birds being the only color it just seems to be missing “something”. Just my two cents. New windows = Yay! So much more clean, bright, and light! Don’t forget to add a bird like your door hardware! I love what you’re thinking of for the wall paper design. I agree with those who have suggested a bit of color with some of the berries. Probably because pops of red draw me in. Is this going to be just behind the piano, as a focus wall? The wallpaper design is going on all of the walls of the music room, but that really only consists of two large(ish) sections of wall since two “walls” basically have no wall space at all. Your new windows look great. It’s amazing the difference they make in the brightness of the room. The room looks bigger. I don’t like the new wallpaper. 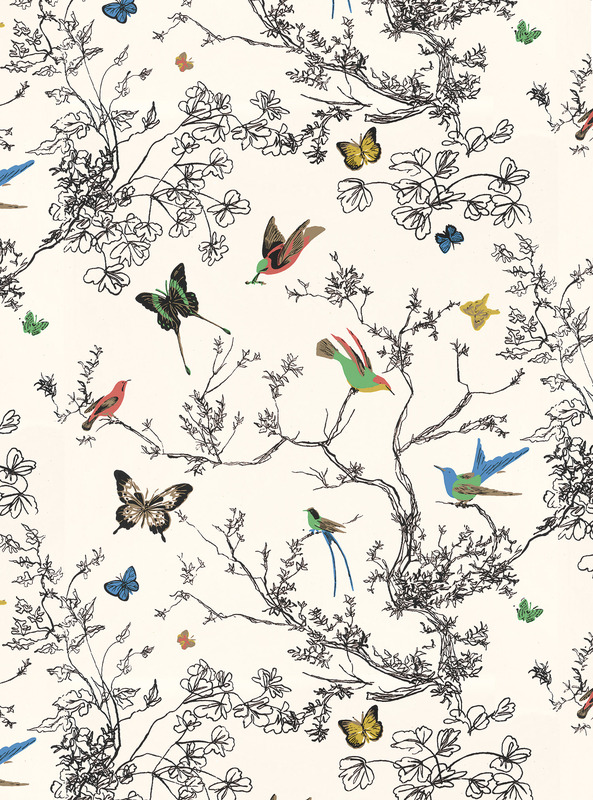 My favorite thing about the wallpaper was the butterflies and I think it looks boring with just birds. I hate butterflies. 🙂 Personal taste is an interesting thing. I have to agree with the other commenters that the cleaned up foliage is much better and that a little random pop of color on leaves or berries would brighten up the overall look! I love the new windows and they really open and update the room. So excited for all the fun stuff to come ( but new windows are fun too)!!! Your windows look great, there in nothing nicer than that clean, clear look !! I love the stencil. The nice part is that with you being so talented you can paint your birds and then later on add whatever you want to the wall. If you decide you want more color at a later date it will be easy for you to add it ! Love the new windows! I wasn’t sure about the 6 over 1, but these look great. The redesign on the wallpaper does appear to have more white space without the butterflies and that throws me off. Not sure what the answer is to that! Maybe a few leaves blowing in the wind?! This is going to be amazing and I can’t wait to see that ceiling! I only have 8 footers so am paying attention to how it will make the room feel. I am a nut for Toile fabric. So, I love the first picture with mostly black and white with just a few birds. I think the second picture is overkill and loses the simplicity. I know you balance the line between classic and modern, but that’s what I love about the first picture. It’s unexpected and simple. Your piano will then shine!! Literally. That’s cool! I don’t personally love how berry-heavy the new design is (or are those small leaves? ), but that’s totally personal preference. If you like it, that’s all that counts. I’m curious why you’re choosing to hand-draw/paint it instead of attempting to have it printed as wallpaper. I know it’s been suggested a few times by both me and others. Seems like a *lot* of work to do it all by hand and the perfectionist in me couldn’t handle any inconsistencies. Could you comment on your decision? I’m curious, not judgy. 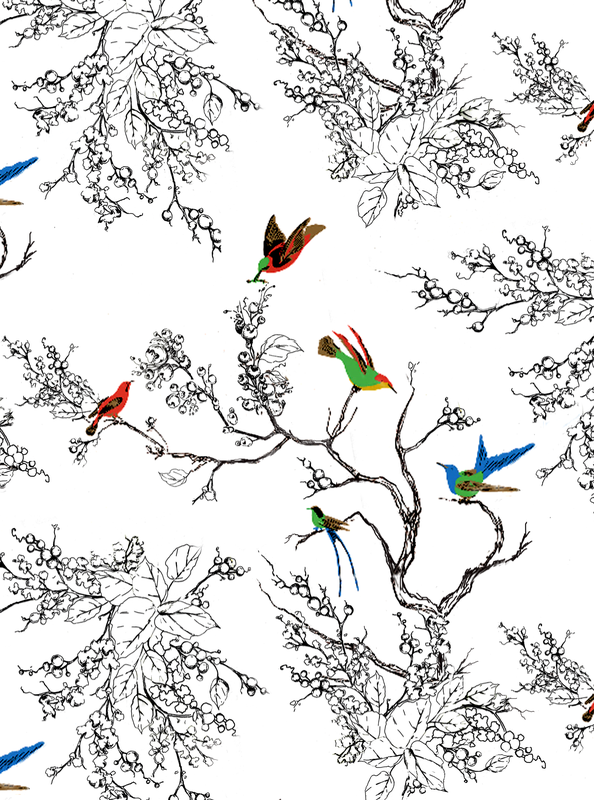 if you’ve got a repeating pattern already why not just get wallpaper from spoonflower? You’d just upload your image and buy it. I think she’s mentioned a couple of times that even the spoonflower price is more than what she wants to pay, given that there really isn’t much wallspace in the music room. I love your design. Why not photocopy the birds…colour them and paste them on to the wall. That’s actually a pretty neat idea. You could use decoupage glue (though it’d ruin the wall). 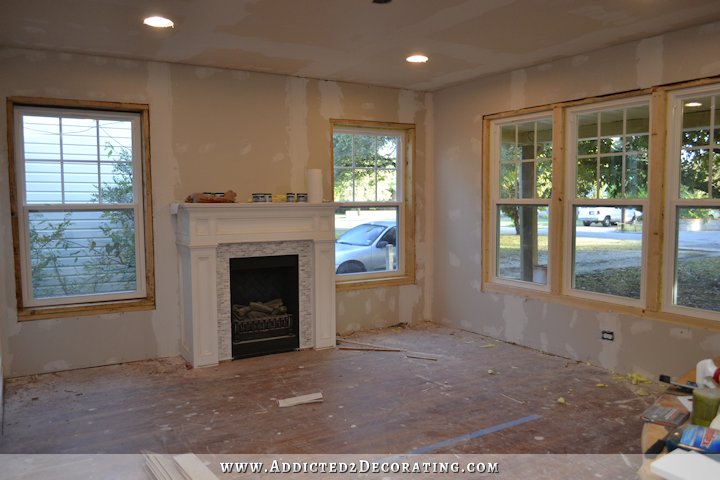 I am so excited for you to have these new windows! These rooms are going to be amazing, I’m sure. I think your mom is so talented too. Opening and reading your blog is something I have to do every day. I really enjoy seeing your progress. What about custom stamps for the birds? If you stamped on just the basic outline of the birds, it would ensure they are all the same shape and size. It would also make it easier to do the same bird at different angles (flying up in one part of the design but flying down in another). As opposed to a stencil, a stamp can give you more areas of delineation inside the bird for a wing or a separate area of color. Then you can hand paint in all the color on top on the stamped outline. Still a ton of work, but will help with the consistency of the size of the birds to give it that wallpaper repeat feel you want. “Custom” sounds expensive. 🙂 I could just make a stencil for each bird design. Your new windows are wonderful and make such a difference! 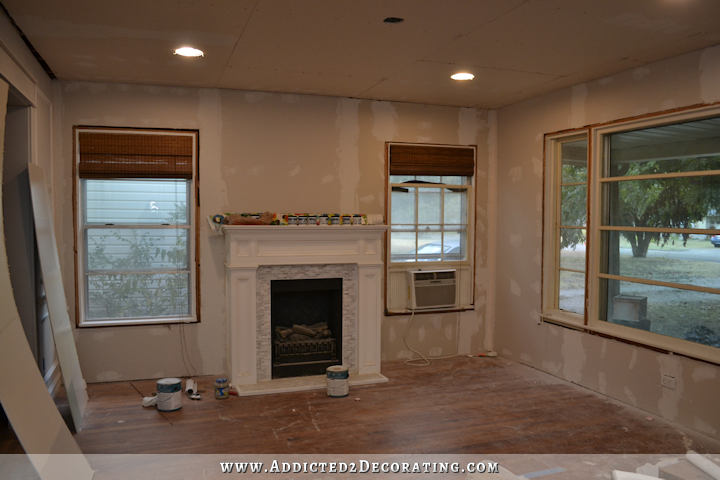 The added natural light will be lovely in this room. The reinvented wallpaper is great too and I respect your choice to improve upon an item you like to make it something you love. I’m truly excited for you to have new HVAC and windows so you can move forward with your dreams. Your home will be incredible and I enjoy watching the transformation. Since you’re doing a repeat pattern are you going to use a projector to keep your pattern on track. You could even enlarge or shrink on the wall to see how you like ahead of time. Maybe you could find one on Craigslist since they’re not used like they used to be. Love the Windows! That was my thought. I think you can rent overhead projectors. I have heard people use chalk to draw the design, then paint over the chalk. A company that I worked for had 2 ladies paint a page from a ad on the company entry wall. They used an overhead projector and were able to increase the size t cover the entire wall. They then drew the outline on the wall and then painted it in. I just think using one of these would keep the size the same all the way even over the doors and along the sides of the doors. This got me thinking if I ever see one at a yard sale I may just buy it. So, I know that you didn’t want actual wallpaper, but have you considered having a stencil made of your mother’s design, and painting it on? 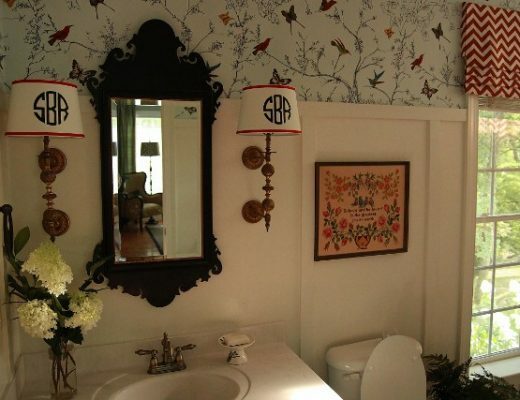 It would keep the pattern exact, go faster, and still be much cheaper than wallpaper. I found a website just doing a quick google search, so I am sure there are more. You just upload your custom design and they’ll print it as large as you need. Love how your home is coming together!